So now that you have your new bunny – where is he going to live? There are pre-made rabbit ‘condos’ or more traditional cages to purchase, you can build your own enclosure, or your rabbit can live in a room in your home. Whichever you choose, here are some basic guidelines to help. Rabbits should have plenty of room in their pen for a litter box, food bowl, water source (bowl or bottle), and toys. Some rabbits also like to have blankets or towels to bunch up and lay on. There should be enough room for the rabbit to ‘flop-out’ for a nap, sit upright without crouching, and periscope up to see what is going on somewhere else. Ramps or shelves in their living area can provide hours of entertainment. Because many cages advertised for rabbits don’t really provide enough room for all these supplies, think about other ways to house your rabbit. What about a large dog crate? A puppy exercise pen? Building one from grids designed for shelving? You will find examples of these at the end of this section. 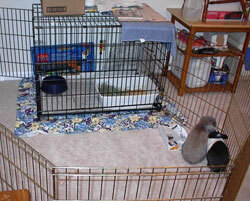 A good minimum size cage is 30”x30”x24” for a rabbit who is approximately 5-6 pounds at adult size. Obviously, if your rabbit is bigger, a larger cage is needed. If you have a baby bunny, think about how big he will get when he is grown up! DO NOT use aquariums or solid walled enclosures. The ammonia from their urine will build up and irritate their nose and lungs, causing health problems. Remember to choose a cage or pen with a door big enough to fit the litterbox in and out! Where should I put the pen? 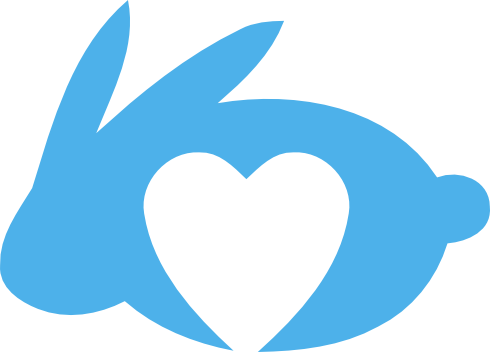 Rabbits are curious and need social interaction with their family. Placing their enclosure in an active or busy room of your home, like a kitchen or living room, will allow them to interact with you and really become a member of your family. What about keeping my bunny outside? Did you know a rabbit who stays outside in a hutch lives an average of two years, but an inside rabbit who is a member of the family lives 7-10 years? Outside rabits can easily get sick without anyone noticing. The wind and rain can penetrate their hutch or their water bottle might freeze in the winter. They can be attacked by predators from raccoons to neighborhood dogs and cats. They can even be scared to death by the presence of a predator outside their hutch! Worse, an outside rabbit never gets to be a member of the family. It’s easy to forget him or get bored with him if you never learn how much he likes hanging out on the couch with you or if you never see him doing the Bunny 500--running laps in the hallway! Have other pets? Many rabbits get along fine with dogs and cats. It’s important to supervise interactions and train your other pets; pretty soon, bunny and kitty could be snuggling together! Rabbits succumb very easily to heat. For this reason, you will need to keep their environment below 80°F. Clearly, this means that you should never keep your rabbit outdoors for long periods of time. If you do not have an air conditioned home, you can create “bunny air conditioners” for hot days. Freeze water in plastic pop bottles and place them in the rabbit’s room. The rabbit will lie next to them to cool off and even use them as toys. Rabbits need plenty of exercise time outside of their enclosures: 30-40 hours of run time a week. This will help your rabbit keep in shape as well as provide him lots of areas to explore. Try to provide 3-6 hours of playtime a day. Rabbits are usually active in the morning and in the evening, but mostly sleep during the daylight and nighttime hours. Do remember that all activities should be supervised – especially if you take your rabbit outdoors for activity. Before you allow your rabbit to run loose in any part of your home, you should “bunnyproof.” Bunnyproofing will protect your rabbit from harm (like electrical shock from chewing lamp cords) as well as prevent the destruction of your property. You can also ensure that your rabbit has fun and safe chewing alternatives that will distract him from chewing on your wood tables and furniture. Electrical cords are very attractive to rabbits. You MUST protect your rabbit from wires so they don’t get hurt! Products such as ‘spiral cable wrap’ and cord channels can be placed around your cords to provide an extra layer of protection from chewing. You can also run your wires behind, under, or above furniture to ensure that your rabbit cannot get to them. Toxic and poisonous plants are dangerous too. Several houseplants, while pretty, are very dangerous for rabbits to consume. The best bet is to hang your plants from the ceiling – but remember to watch for fallen leaves and flowers. Remember that some rabbits will jump on chairs and other furniture and be able to reach plants (or remote controls, nice coffee table books, etc!) that shouldn’t be chewed! Minimum size 30”x30”x24” for a 5-6 lb. adult bunny. Include litterbox, food bowl, water bowl or bottle, and toys. If the cage has a wire bottom, protect bunny’s feet by placing a doormat or other solid flooring item on part of the floor area. Look for a cage with a side/front opening door so bunny can hop in and out at playtime. An additional top opening panel is helpful for cleaning. Sold for dogs, a collapsible metal pen usually consisting of eight panels two feet wide by varying heights. A 30-36” high pen is good for a rabbit (they jump over short ones, especially smaller breeds!). Some pens have a door in the side of one panel, and tops and extensions can be purchased for many models. A very simple setup for a rabbit is to put down a waterproof barrier such as a tarp or shower curtain, and then a carpet or vinyl flooring remnant. Place the pen on top (4’ x 4’ square shape is great). Ex-pens are nice because they are portable, configurable to many uses (blocking off a large play area as well as a closed pen), and easy to clean. These pens are easy to let bunny out for playtime by opening the door or detaching clips between two panels. Try to choose a large or x-large size for plenty of floor space for bunny. You can add a shelf to the back portion of the crate so bunny can climb on top or hide underneath. The very large door makes it easy to clean these homes and bunny can hop in and out during playtime. Dog crates are also very sturdy to help keep out kids or other pets, and many people have an extra from training their dog! Online cage instructions will help you make this inexpensive and highly configurable type of cage. Use the 14-15” square grids sold as shelving cubes at stores like Kmart, Target, Meijer, office supply stores (brands like Neat Idea Cubes, Organize It). A good basic grid condo is a 3-grid wide by 2-grid deep by 2-grid tall arrangement with a 2-grid shelf on one end, but these condos can be made in all kinds of sizes and heights. Included fasteners can be strengthened by using cable ties on the grids. Put a vinyl remnant under the condo and have a “door” by allowing one bottom front grid to swing on cable tie hinges on one side and clip shut on the other side. A simple condo costs about $20-30 for supplies. A kitchen nook, sunroom, or bathroom might be a great place for bunny to stay. Use a baby gate or puppy exercise pen to block the area from the rest of the house, and open the gate during playtime.